SAVE THE DATE! 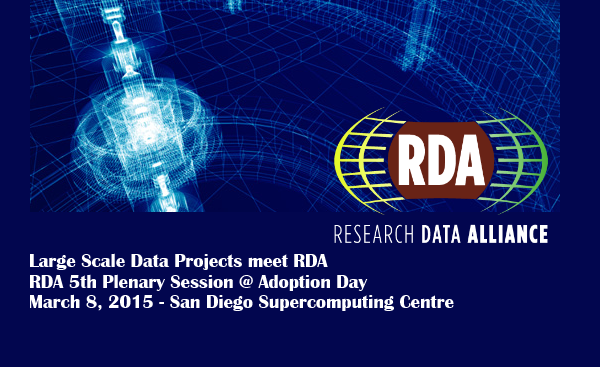 Large Scale Data Projects meet RDA - Plenary session scheduled to take place on March 8, in the afternoon of the 5th Plenary Adoption Day hosted by the San Diego Supercomputer Center, 2 PM to 6PM. The aim of the Special Session of the 23rd Euromicro International Conference on Parallel, Distributed, and Network-Based Processingis to bring together HM and ICT researchers – and in perspective the Climate modeling community - in order to present and discuss solutions while facilitating collaboration between the Hydro-Meteorological (HM) and ICT communities. 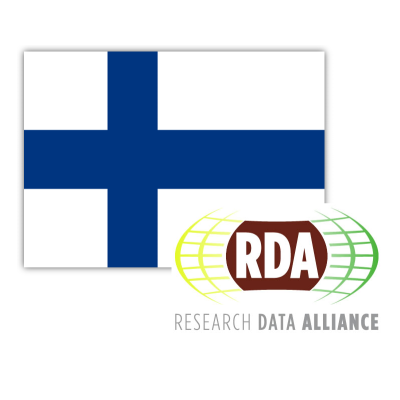 The “What does the Research Data Alliance offer for Finland?” Seminar will be held on the 10th of February 2015. The aim of the event is to discuss the outcomes and benefits of the RDA to the Finnish research community and not only. Topics of open science and global exchange of research data will also be discussed. The Research Data Alliance and global Data and Computing e-Infrastructure challenges event is being organised within the framework of the Italian Presidency of the European Union and will take place in Rome, Italy on 11th & 12th December 2014. CASRAI ReConnect conferences are fast becoming the preeminent annual events for tackling the inter-related problems of administrative burden on researchers and business intelligence friction for research managers. The North American conference every autumn is now joined by a European conference every spring. They are an opportunity for researchers & research management experts to share, network and learn with others who are tackling the same issues. What: A one day workshop organised by ELIXIR, BioMedBridges and RDA to kick-start agreement on a common topics vocabulary to classify resources in the life sciences domain, including databases, tools, courses, training materials, meetings, jobs and publications. The APARSEN Project is pleased to announced that registration is now open for our next training course: Access and Usability in Digital Preservation. As digital preservation standards and practices reach new levels of maturity we begin to find increasing focus on issues surrounding the access and use of preserved digital objects. This one day workshop “Building up Open Access, Open Education and Open Data for Open Science” is aimed to bring together participants from various disciplines to enable an in-depth dialogue focused on Open Access , Open Data and Open Education for building synergies and collaboration opportunities for Open Science and also with the "Geo for All" http://www.geoforall.org initiative.